The Ifor Williams range available from East Coast Trailers includes flatbed trailers and plant trailers that have been specifically designed to transport plant machinery. Durable, tough and easy to tow, all plant trailers, flatbed and plant trailers come with the Ifor Williams galvanised steel chassis system. The GX Series plant trailers are constructed from folded pre-galvanized steel sections with filled-in sides for greater flexibility. The new body design allows the machine operator to safely step down from the cab. 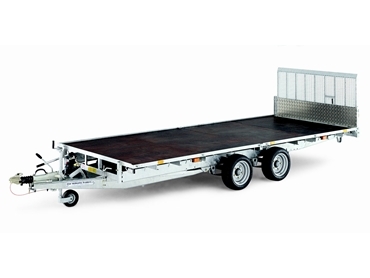 GX106 Trailers are offered with hinged adjustable skids or a full-width loading ramp. Sizes range from the smallest GX84 up to the largest GX126. The iFor flatbed trailers are durable and reliable and feature hot-dip galvanised chassis and 18mm high density plywood with a tough phenolic resin coating on both sides.